Data breaches are reported with alarming regularity, and can result in your name, address, phone number and credit card detail being sold online to the highest bidder on the dark web. This gives identity thieves and scammers all the information they need to place an online order, as if they were you. Given that data breaches are likely to continue happening, consumers are well advised to seek out ways to buy things online without directly sharing their credit card details with online stores. Here are some ways to do that. Paypal, Square Cash, and Venmo are examples of “payment agents.” Paypal, for example, stores your payment card data securely. It pays your tab when you check out on an e-commerce site, and charges the amount to your card. The seller never gets your card details. But not all e-tailers accept such indirect payments; they insist on card details. For them, another solution exists. 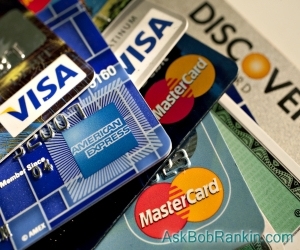 “Virtual credit/debit cards” function like a temporary or disposal credit card that is valid for only one transaction. You get a card number, expiration date, and security code, minus the plastic. After you use that virtual card to pay for something, it can never be used again. Your real card is charged the amount of the transaction. The online store where you made the purchase never sees your real card’s details. And guess what else? They can't ding you for those sneaky recurring "membership," "subscription," or "renewal" fees. I wrote about these in my recent article Beware The Recurring Charge Scam. Virtual cards are available from some card issuers, including Bank of America ShopSafe, Capital One ENO, and Citi Virtual Account Numbers. The latter are available only on select cards; log into your Citi account to see if your card qualifies. Some credit unions offer virtual debit card numbers that work with the Visa debit cards issued with new accounts. If your bank or credit union does not offer virtual cards, there are third-party services that can give your one-time virtual card details and charge the amount to a real card whose details you provide. Privacy.com is one such service. Blur Premium is a comprehensive privacy app that includes virtual card numbers as one feature (Blur calls them “masked” card numbers). There are more features to virtual cards than just “use once” security. You may also be able to create a virtual card that works repeatedly but only with one merchant that you specify. You may be able to set an expiration date of up to one year on a virtual card; that effectively shuts down automatic annual renewals. When used, these features can make stolen card numbers virtually useless to thieves, while sparing you the hassle of generating a new card number for every transaction. Virtual cards are not accepted by all merchants, unfortunately. There are various reasons why a merchant might reject virtual cards; the most legitimate one is that additional fees of 2-4% associated with the use of virtual cards are taken out of the merchant’s receipts. Virtual cards are not invulnerable protection against fraud. But they do provide strong protection against unauthorized use of your card details. Talk to your bank or card issuer about virtual cards and other enhanced security features you may not know about. Implementing enhanced security could spare you financial loss, and it will definitely give you greater peace of mind. Most recent comments on "Virtual Payment Cards - What You Need to Know"
I use the CapitalOne ENO card, and it works very easily. You can also save the virtual card for a particular site if you use that site frequently--or you can generate a new one each time. BUT, beware--I had real trouble returning an item to Target because I didn't have the actual card with the actual number to give them. I wound up having to take store credit. So, as much as I'd like to use the virtual card for everything, if it's something I might have to return, I won't use it. Which kind of defeats a large part of the purpose, IMHO. Yes, Capital One ENO ("One" spelled backwards -- how cute?) does offer virtual payment cards -- but NOT for their business customers. Citi Bank also offers virtual payment cards -- but NOT for the Costco Visa card. Do you know of any virtual card services that work for Canadian residents? Very interesting and informative and useful. Thanks. Yes, PayPal is a way to make purchases without providing vendors with your credit card information but there is a lifetime spending limit that can only be lifted if you add and verify your bank account to PayPal, or apply for a PayPal credit card (now providing them with your SS number) if you want to continue using your current credit card for purchases. Both TMI in my opinion. I also have a concern when the webpage changes from the vendor to PayPal where I have to log in to authorize the payment, then when the payment is completed the page reverts to the vendor. I have a concern that they can access my password that I typed in while on the PayPal website. I prefer to use a "clean" new browser/webpage but if I do that the PayPal payment will not process. FYI, using the Bank of America ShopSafe requires you to specify a maximum amount for the transaction. Now that more and more internet transactions are collecting sales tax, one needs to allow for that when setting up the virtual transaction. ShopSafe also requires you to enter the CVC number in order to generate the virtual card. Citi's Virtual Account Numbers does not require a maximum amount to be specified prior to generation. Citi does make it more difficult for those of using Safari on a Mac but they think they are just being extra cautious because of ignorance about Microsoft security. Bob, as always I appreciate the constant updates you provide. I just started using Capital One Eno this past week. I would often pass up some deals for websites that I didn't feel comfortable with. As for TMG, I don't see very many political comments on this site. I think some people are just too sensitive. At any rate don't let the door hit you in the a$$ when you leave. Or as my wife said to one of my children when they were young: You ran away from home? When? They too got over their mad. You leave out Discover’s virtual service & Apple Pay. I too use Bank of America's virtual credit card (ShopSafe) JGS says: "using the Bank of America ShopSafe requires you to specify a maximum amount for the transaction. Now that more and more internet transactions are collecting sales tax, one needs to allow for that when setting up the virtual transaction. ShopSafe also requires you to enter the CVC number in order to generate the virtual card." What he says is essentially correct but allows for inaccurate assumptions to be made. Since this is essentially a one time only transaction I usually make the maximum transaction for more than the stated amount. But on a few occasions the maximum I listed was under the finally cost. B of A allows you to change the maximum before you finalize everything with the website you are dealing with. I don't think they always did this but they do now, recognizing that some companies do not give you the total until after give them your credit card number. He also says that you are required to enter the your CVC number (Which is different from the CVC number on your virtual card, this is for safety reasons) If you want more info on this I would be happy to provide this. I use PayPal but have problems with USA buying due to .com on end of card I think- iSP has .au or net or org but I got plain .com which sounds like American database ISP methinks. so I have to give my credit card details there. Here OZ stores are linked into PP so nothing on browser as click cart and it goes automatically via Paypal and confirmation email follows with order details etc. Others store your card - but 1st time - open to hackers. Beat me Jon I'm only an octogenarian rofl, nice to see we're a well aged so wise to be part of the bunch of Bob Fans. Congratulations are in order for both Jon and Samatha!!! I am three-quarters of a century old and that in of itself is a real milestone. I tried to join Privacy.com over a year ago, realizing that Virtual Credit Cards were the way of the future in online payments. However, they could not help me, since my financial institution was not on their list of banks that were working with them, at the time. However, I did get a very nice response back from Privacy.com about being sorry that at this time they were not able to provide their services to me. I almost always feel when a company takes the time to respond to you, explaining the issues within a few hours ... That is someone I would like to do business with. If, my memory serves me correctly ... I believe they answer my request within the hour. I didn't have to wait days to get the answer why I could not use the Virtual Cards they offered. I do believe it is time to try again. A lot can happen in a year's time, can't it? I've been using Blur as my password manager for a bit over three years, just renewed for another three. What I like about it is that it works seamlessly across all my devices which include a Windows desktop, iPhone, iPad and MacBook. It works in browsers on all of those, syncs automatically, and works as a standalone app on the iPhone and iPad too. It offers not only "masked" cards for any transaction but one time throwaway masked email addresses too. No breaches that I've ever heard of and great customer service. No, they don't pay me, I pay them, I just really like this one. It doesn't rank highly in password manager searches but I don't know why, it does everything any of the others do but still manages to stay under the radar. One of my favorite products.